Gag Grouper can be a challenge to catch. Provided are the regulations for the state of Florida. 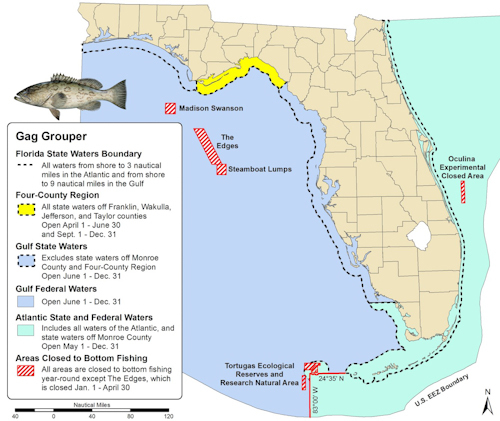 Grouper are managed differently in the Gulf versus Atlantic and in state versus federal waters. Gulf state waters are from shore to 9 nautical miles. The Atlantic state waters are from shore to 3 nautical miles. There is a map provided below for reference. Gag Grouper must be a minimum of 24 inches total length. 2 per person within 4 grouper aggregate.